I hope everyone made it safely through another snowy day. If you need a nice indoor activity for tonight - boy, do I have a list for you! ANNIE at the Academy, SPELLING BEE at Amherst High, or maybe OUTSIDE MULLINGAR at the Majestic? Stay cozy. Can vision be collaborative? How can I balance inclusivity, safety, quality, and rigor? Why do I keep trying to make collaborative work, when it seems so much slower and more difficult than doing it myself? I’ve been asking myself these questions for the last ten years or so, and trying new ways to answer them every time I direct a piece of theatre. I’ve recently stumbled across a revolutionary way of working that has become the foundation of my collaborative practice: Open Space. Academy Youth Productions presents ANNIE, Jr.
March 8, 9, 10 at 7:30; kid-friendly matinee on March 10 at 2:00. Amherst Regional High School presents this 2005 Tony and Drama Desk Award-Winning musical comedy in an innovative staging. Upon your arrival, you be welcomed into the lobby and auditorium (and other locations, if you're keen...) of Putnam County Middle School as fellow community members attending this special anniversary edition of their beloved Spelling Bee. 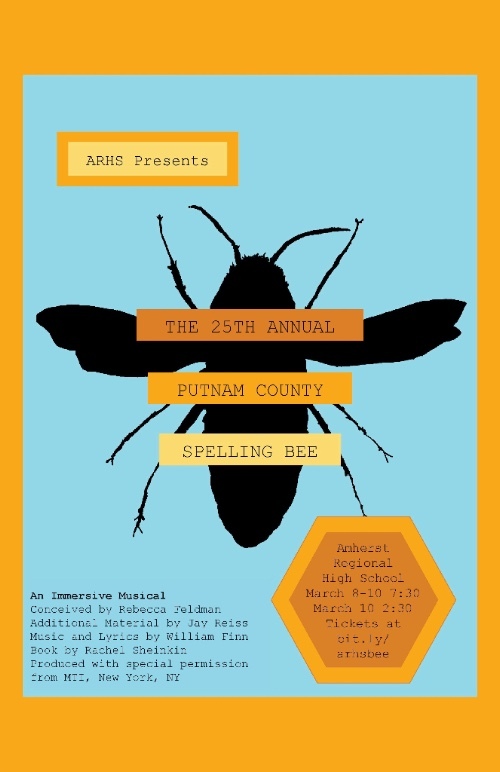 Continuing our tradition of investing deeply in student leadership at all levels of the show, Spelling Bee is performed, designed, played and produced by over 130 ARHS students. A warm, silly and immersive production, you'll find all that you'd hope for from a winsome Broadway musical, along with spaces to explore and in-character performances before curtain and during intermission. And - each night - a new contingent of volunteer audience spellers invited to join us as on-stage competitors in the Bee! 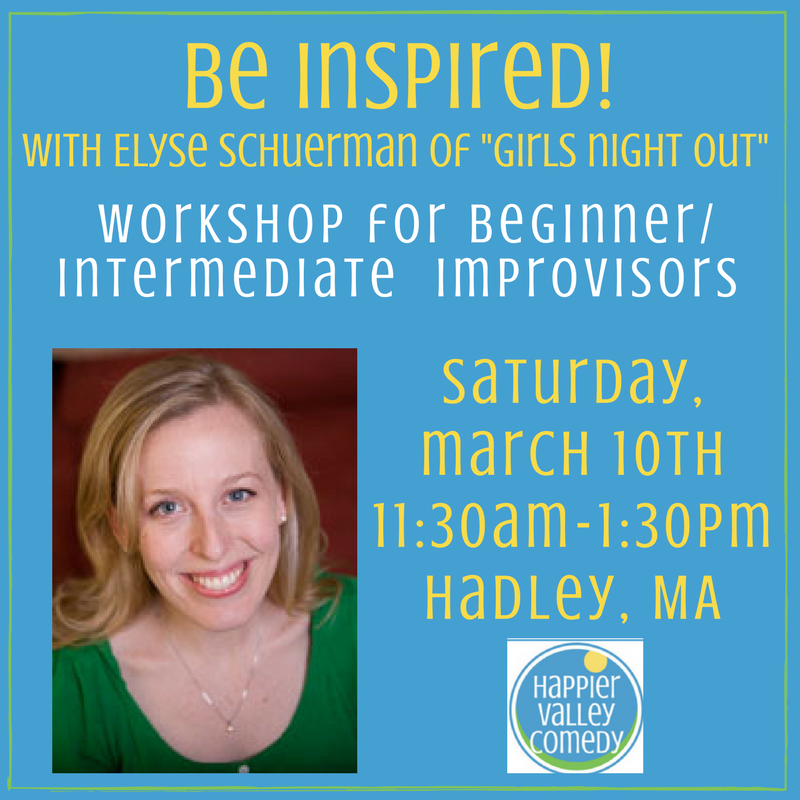 Happier Valley Comedy Show - All-new monthly improv comedy show! This month features The Ha-Ha’s and special guest performers Girls Night Out. 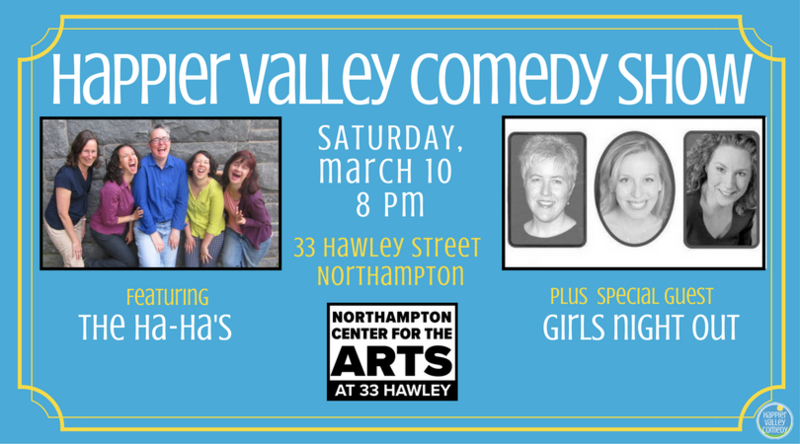 Saturday, March 10th at 8pm at the Northampton Center for the Arts in the Arts Trust Building (33 Hawley St., Northampton, downstairs entrance). Tickets: $13 at the door. For more info. 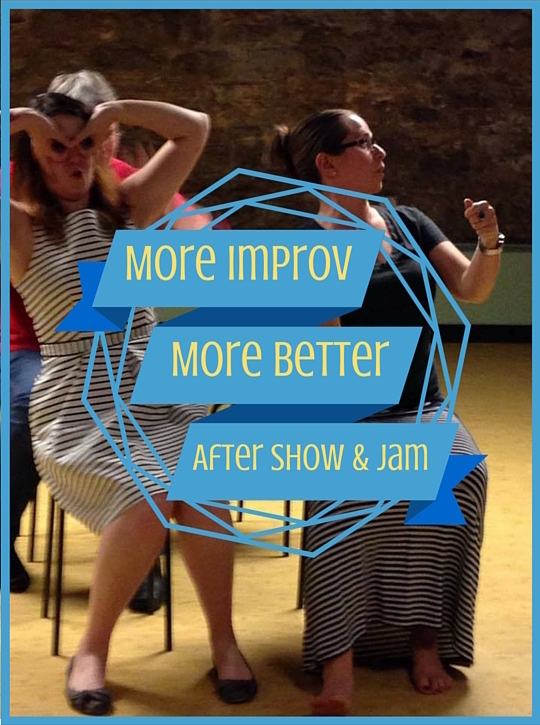 More Improv, More Better Improv Jam & Showcase (Happier Valley Comedy) - Open improv jam for everyone and anyone to play and watch improv games, plus a showcase set featuring up-and-coming improv team H.A.T.S. Saturday, March 10th at 10pm at the Northampton Center for the Arts in the Arts Trust Building (33 Hawley St., Northampton, downstairs entrance.) Suggested donation: $3-5. For more info. SYRUP 2018 will feature another delicious potpourri of world class performance for all ages, syrup tasting, free Real Pickles and more! This year, Piti Theatre Company’s much loved sweet event has a new venue and . . . more syrup! We will enjoy the flexibility of two stages and a working kitchen at Shelburne Buckland Community Center, 53 Main Street, Shelburne Falls. Join us from 11 – 2:30 for a Pancake Brunch-Party! Enjoy pancakes with a wide selection of local maple syrup served by a very special costumed waitstaff (Piti’s Youth Troupe). Carrie Ferguson will perform some songs from our new album, Greatest Bits, Vol. 1 at noon and Piti’s Youth Troupe will perform “The Lion, the Lamb and the Wizard” at 1 pm. 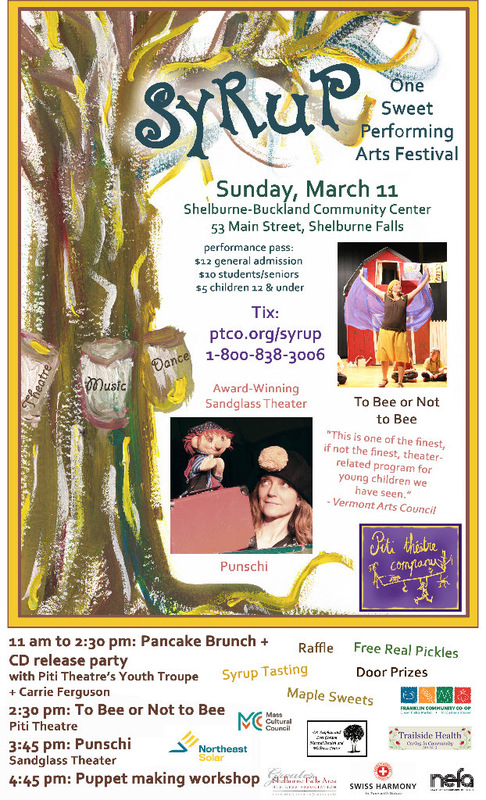 Piti Theatre’s family audiences musical “To Bee or Not to Bee” will return to the area after several years of touring in New England and Europe at 2:30 pm AND award-winning Sandglass Theater from Vermont will perform their puppet piece “Punschi”for all ages at 3:45 followed by a puppet making workshop for ages 6 – 14. Frontier Regional High School presents The Wizard of Oz! March 16 & 17 at 7:00 p.m. March 18 at 3:00 p.m.
Happier FAMILY Comedy Show: Monthly family-friendly improv comedy show, best for 5-12 year olds and their adults. Saturday, March 17th at 3-4pm at The Eric Carle Museum of Picture Book Art (125 W Bay Rd., Amherst). Tickets at the door: $10/Adults, $5/Kids, Free/4 yrs and under (Reduced admission for museum members). For more info. Does gender affect how we perceive public and political figures? A UMass Theater alumnus examines the evidence via performance. UMass Theater presents a talk by Joe Salvatore '97G, an artist and educator who's looking at the way gender influences our perceptions when political and cultural figures speak, by having actors of the opposite gender perform their words in the format called "verbatim theater". He's speaking about his experiences on March 20 in the renovated Old Chapel on the UMass campus. The event is free and open to all. In January 2017, playwright and director Joe Salvatore '97G collaborated with economist Maria Guadalupe (INSEAD-France) to create Her Opponent, a re-staging of excerpts of the 2016 U. S. Presidential debates with gender-reversed casting. Following the success of that production and its subsequent Off Broadway run, Salvatore has created NYU-Steinhardt’s Verbatim Performance Lab to continue to produce live and mediated verbatim performances that challenge accepted political, cultural, and social understandings, while embracing the philosophy that social change emerges from dialogue, not monologue. Join Salvatore as he shares his experiences working on Her Opponent and recent Lab projects including The Lauer / Conway Flip and The Moore / Jones Challenge. 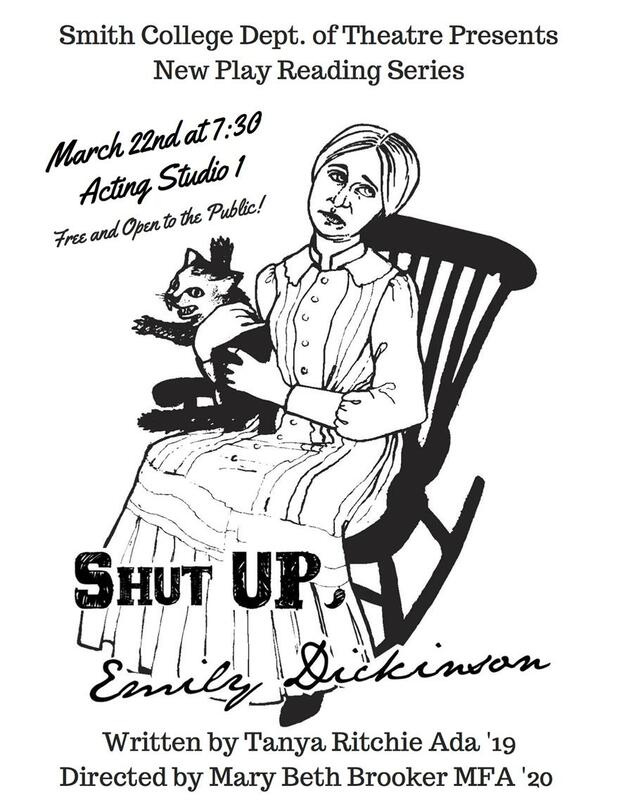 March 21, 23, 24, 28, 29, 30 at 7:30 p.m.
Emily Dickinson: poet, recluse, a**hole. Loosely based on the Master Letters, Shut UP, Emily Dickinson! is a pseudo-historical, quasi-biographical, hysterically existential psycho-romance about America's most brilliant and annoying poetess. Holed up for all eternity in the bedroom of our minds, the “woman in white” stretches into a projection screen for truths, half-truths, truthiness, and truth-less-ness. She’s whatever you want her to be and nothing you imagined. Emily Dickinson is the definition of a difficult woman. · Auditioners should prepare a one to two minute monologue. · Equity & non-Equity; all roles paid. by Athol Fugard. Director: Rebecca Daniels. Elsa: 30s, politically engaged schoolteacher. Marius: 60s, Calvinist pastor, good-hearted but deeply conservative. Based on a real-life individual, Fugard’s story of Miss Helen, an aging Afrikaner widow who creates unusual sculptures in order to escape the crushing reality of her isolated life and the social expectations that accompany that life, brings together two social and political opposites who each consider themself her friend and take astrong interest in her welfare according to their own conflicting views about artistic creativity and the challenges of aging. Her very conservative minister, Marius, wants to send Helen to an old folks home, where she will be “safe” from both criticism and harm. Her young friend, Elsa, more politically engaged than Marius, wants Helen to have the independence as a woman and an artist that society seems to find so dangerous. Joe Renshaw - 65-70, white. Academic type. Divorced. Walter Jones - 25-35, black. A teacher and musician. Walter, a black man, breaks into the home of Joe Renshaw, an older white man, late at night. Walter has fled the scene of an altercation with a white off-duty police officer, during which he took the officer’s gun. It is not the way it seems. As Joe and Walter struggle to establish a fragile détente, Officer Lou Rankin finds the house.. A taut life and death stalemate ensues as the three desperate men struggle to stay alive and to protect their families. Issues of race, trust, responsibility and last straws comprise powerful themes in the story. The 2018 season will close with the fall presentation of Delectable Durang, a collection of six hilarious and provocative one-act plays by Christopher Durang. The production, directed by John Reese, will be an ‘homage to the theatre‘. The six plays are The Actor’s Nightmare, Women in a Play Ground, Nina in the Morning, For Whom the Southern Belle Tolls, One Minute Play and Medea. Every theatrical element (costume and set changes, etc.) will be in full view of the audience throughout, as six actors function as a mini-repertory company. Reese is seeking skilled and spirited actors capable of portraying a variety of multi-dimensional characters with serious personal issues who fearlessly leap into Durang’s world of comic mayhem with emotional abandon and a bountiful sense of play. Hampshire Shakespeare Company is currently seeking a Dramaturg, 2 Stage Managers, and a Technical Director for the 2018 summer season of Othello and Twelfth Night and the Young Company production to follow. Please click here for more information on how to apply! Whether you are new to improv or a long-time veteran, the start of a scene can feel challenging. This is very normal considering the wide canvas you are working with. What you choose at the top affects the rest of the scene. 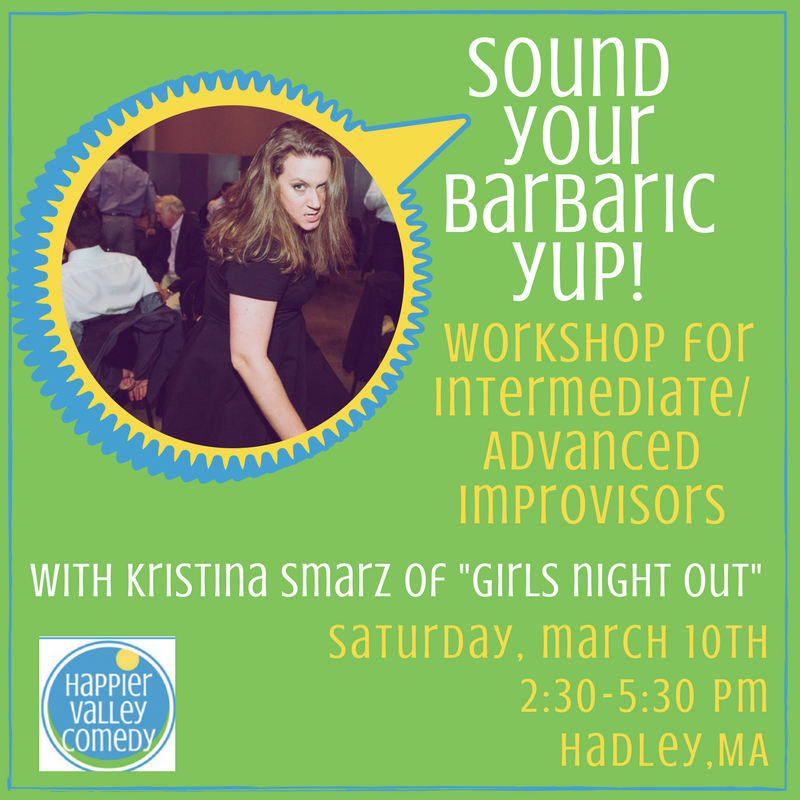 Newer improvisers are often overwhelmed with choices and options and have concerns about making the right choices. 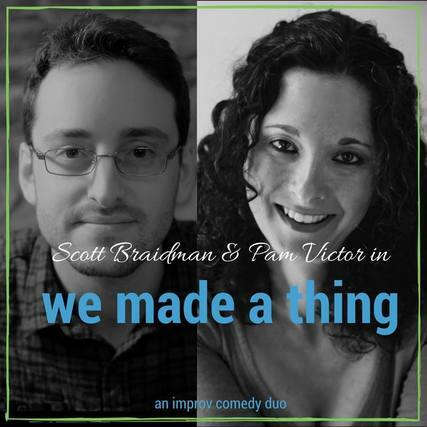 Veteran improvisers often fall back on the same tools over and over and find their choices getting predictable. In this 2-hour workshop we will address the many options and tools we can choose from and how we can ground ourselves to complete a scene with those choices. Prerequisite: Completion of Zen of Improv 2 or the level two equivalent from another comedy school. $30 Fee. Do you find yourself struggling to get inspiration for scenes? Are you spending more time trying to be original than you are connecting with your scene partners? Are you finding you play from conflict, frustration, or sometimes just find yourself not having fun? If you answered yes to any of the questions above, this workshop is for you! (If you answered no to all of the above, you should probably also take this workshop.) Come discover the joy of saying YES with full commitment and excitement. In this workshop, well explore what saying yes really means, how we can say it more fully, and how we can say it through both words and actions. Well explore concepts such as extreme agreement, commitment, inspiration, mirrored-play and work to find the strongest connections possible. Participants will leave with a handful of new tools that can be used in almost any circumstance to give them a new sense of grounding, play and confidence. Prerequisite: Completion of Zen of Improv 4 or the level 4 equivalent from another comedy school. $40 Fee. 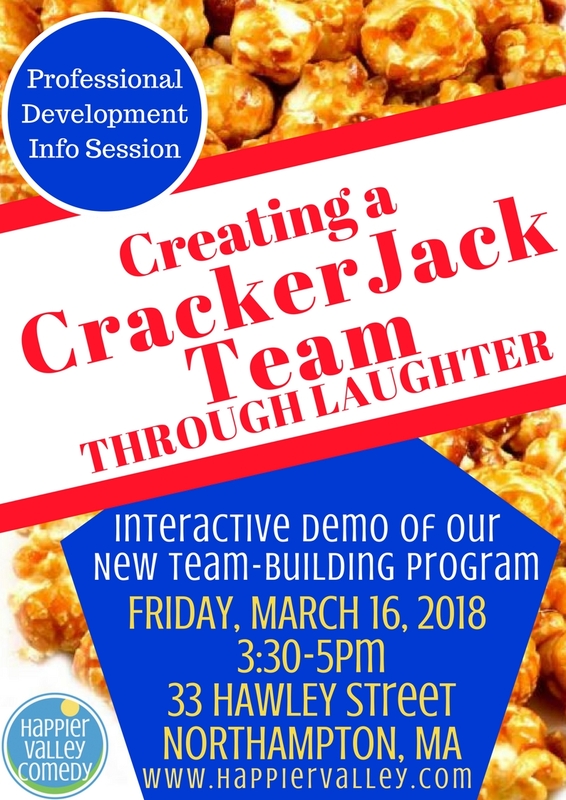 Creating a Crackerjack Team THROUGH LAUGHTER, showcases a new professional development workshop that strengthens and deepens your teams communication and collaborative skills using the tools of improv and experiential training. 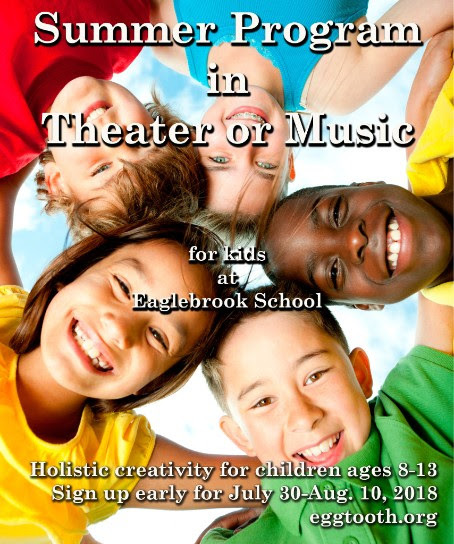 You'll win two prizes the excitement of participating in a hands-on, fun, and creative learning experience, and the prize at the bottom of a Crackerjacks box!